Glaciers in the Alps do not shed city-sized icebergs or stand as tall as high-rise buildings—like those closer to Earth’s poles do. Instead, many glaciers in this mountain range span an area of less than 1 square kilometer (0.4 square miles). However, they are still vital for regional water and power supplies. And like many glaciers around the world, these small glaciers are getting even smaller. 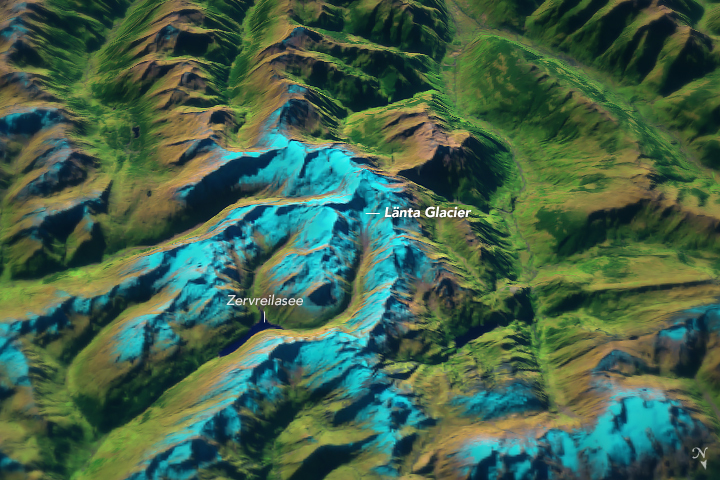 The images above show the shrinking ice area of Länta Glacier in the Swiss Alps. 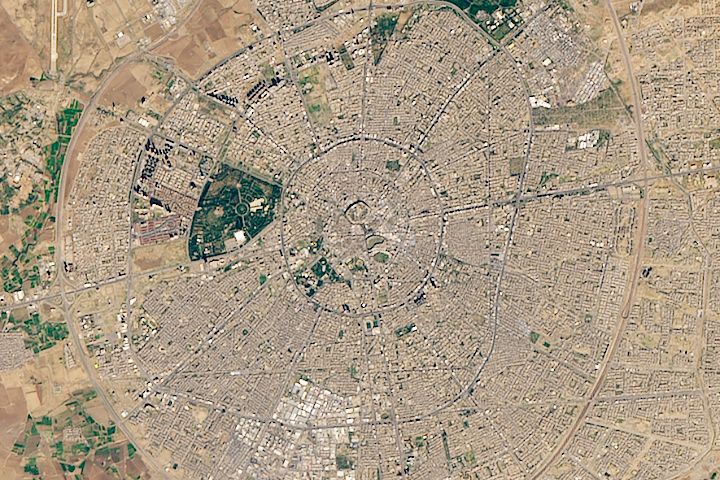 The Thematic Mapper on the Landsat 5 satellite acquired the first image on October 2, 1989; the Operational Land Imager (OLI) on Landsat 8 captured the second image on September 8, 2017. Both images, draped over topographic data from NASA’s Shuttle Radar Topography Mission (SRTM), are false color and use a combination of visible, near-infrared, and shortwave infrared light. 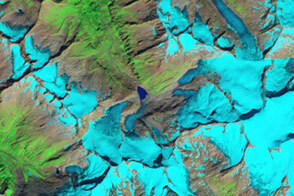 Snow and ice appear turquoise; liquid water is dark blue; and exposed land and vegetation is brown and green. Records indicate that 150 years ago, the glacier was three times larger than today and extended into the valley. The map here shows the glacier’s extent in 1850, 1973, and 2010. 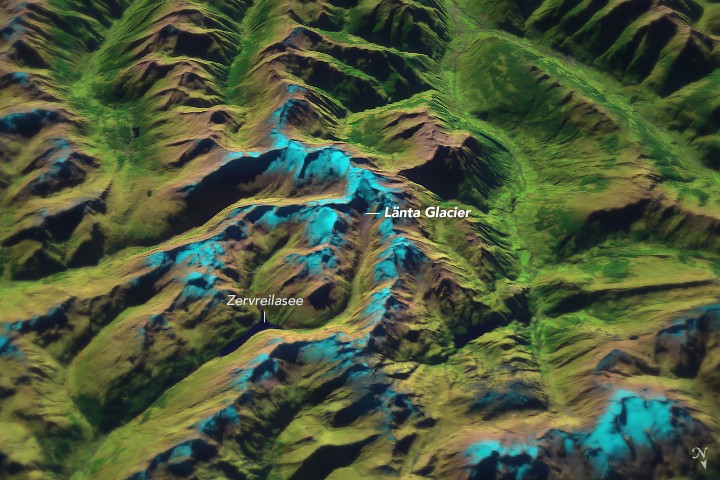 But even during the few decades spanned by the two Landsat images above, the glacier’s length retreated 1.4 kilometers. The measurements are from the Glacier Monitoring Switzerland (GLAMOS) program, which monitors long-term changes to glaciers in the Swiss Alps. View this time series to see how the length of Länta Glacier has declined since 1895. Following an extreme melt year in 2015, the glacier retreated a few hundred meters within one year. The rapid retreat was due to the loss of a thin connection between the top part of the glacier and the glacier tongue. The newly fragmented glacier is especially clear in the pair of photographs above, from 2009 (left) and 2016 (right). The photos were taken by scientists during annual visits to measure the retreat of the glacier’s terminus. Länta Glacier is part of the Rhine catchment, and the meltwater ultimately flows north to the Netherlands. More immediately, in Switzerland, it flows into Zervreilasee—a dammed reservoir with a hydropower facility. 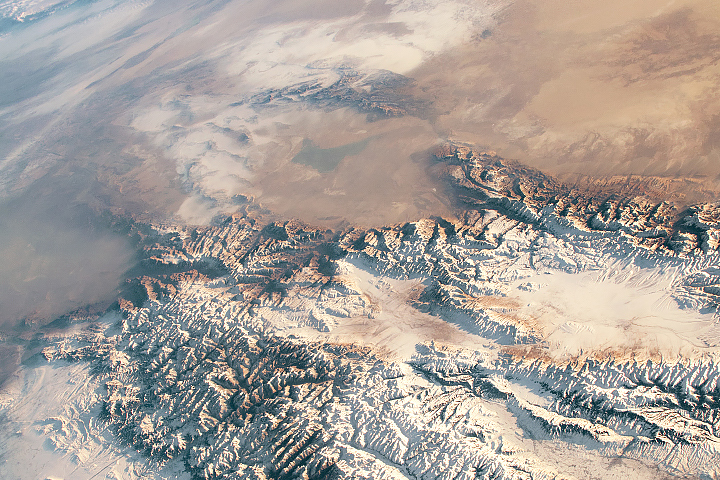 NASA Earth Observatory images by Joshua Stevens, using Landsat data from the U.S. Geological Survey, and topographic data from the Shuttle Radar Topography Mission (SRTM). Photos courtesy of Archive VAW/ETH Zürich (Bernard Riedi AWN/GR). Story by Kathryn Hansen. AGU Blogosphere: From a Glacier’s Perspective (2019, March 11) Läntagletscher, Switzerland Separates From Rapidly Melting Terminus Lobe. Accessed March 29, 2019. 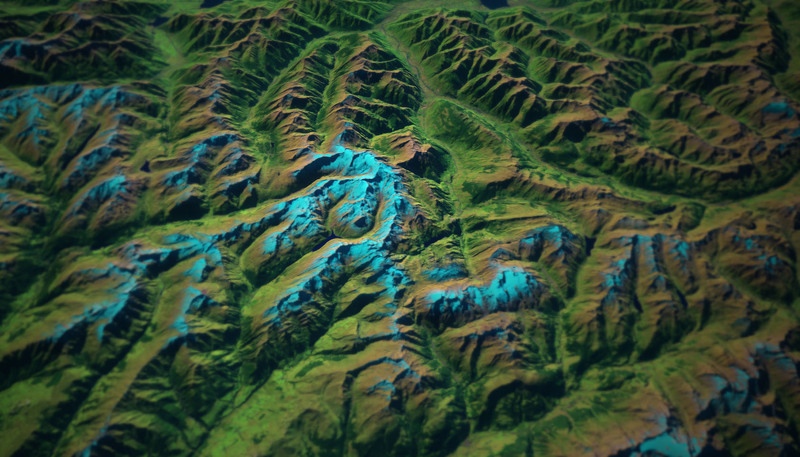 Glacier Monitoring Switzerland (GLAMOS) (2019) Swiss Glaciers. Accessed March 29, 2019. Huss, M. et al. (2016) Sensitivity of Very Small Glaciers in the Swiss Alps to Future Climate Change. Frontiers in Earth Science , 4 (34). The New York Times (2018, February 14) Where Glaciers Melt Away, Switzerland Sees Opportunity. Accessed March 29, 2019. Schaefli, B. et al. (2019) The role of glacier retreat for Swiss hydropower production. Renewable Energy , 131 (2019), 615-627.